Darren Julien is the founder of Julien's Auctions and President/Chief Executive Officer. A third-generation entrepreneur, Darren has been in the auction industry for his entire business career. As CEO he is charged with the overall vision and expansion of the Julien’s brand. He is also responsible for creating, planning, implementing and integrating the strategic direction of the organization and heads the Global Leadership team. He is a graduate of the Reppert School of Auctioneering which was established in 1921 and earned a Reppert Diploma, a sign of excellence in the field. It is his experience, expertise and enthusiasm that has propelled Julien's Auctions to the market leader position. Darren’s unique understanding and sincere passion for the entertainment and sports memorabilia markets led him to found Julien’s Auctions in 2004. His network and marketing talents fueled early sale partnerships with Christie’s and Sotheby’s including Property from the Estate of Johnny Cash, CHER, and designer Bob Mackie along with rock and roll and film sales. The innovative marketing campaigns and environments created by Julien has led the auction house to the dominant position it maintains in the industry. Collaborating with the famous and exclusive, Julien’s produces high profile auctions around the world, customized for particular markets and collectors. With high profile events in the sports, film, music and art markets, Julien’s has received international recognition for its auction events that attract thousands of collectors, investors, fans and enthusiasts from around the world. Darren has been responsible for the sales of iconic artifacts and notable collections including the property of Marilyn Monroe, PELÉ, Mohammed Ali, Bette Midler, Joan Collins, John Lennon, Ringo Starr, Lady Gaga, the street artist Banksy, CHER, Michael Jackson, U2, Jimi Hendrix, Barbra Streisand, Bob Hope, Elvis Presley and Frank Sinatra, among many others. In 2016, Darren oversaw the three-day auction event of MARILYN, featuring property of famed acting coach Lee Strasberg, Lord David Gainsborough-Roberts and the infamous Jean Louis dress the legend wore at Madison Square Garden in 1962. Julien’s Auctions was recently awarded its second placement in the Guinness Book of World Records for the sale of the world’s most expensive dress ever sold at auction, the Marilyn Monroe “Happy Birthday Mr. President” dress which sold for $4.81 million. In 2009 Julien’s first achieved placement in the Guinness Book of World Records for the sale of Michael Jackson’s white glove which sold for $480,000, making it the most expensive glove ever sold at auction. Julien’s vision, risk-taking, innovative marketing plans and industry reputation have created one-of-a-kind exhibition partnerships with the Museum of Style Icons in Ireland, the Museo de la Moda in Chile, the Hard Rock Café in New York, and the Palms in Las Vegas, to name a few. Darren’s passionate focus on all things pop culture and contemporary sets Julien’s far apart in the auction industry. His innovation and differential strategy of “take the auction to the targeted buying crowd” has been responsible for much of the brand’s success. In addition, Darren’s early adoption of digital real-time bidding has enabled the company to build a truly global buying audience. 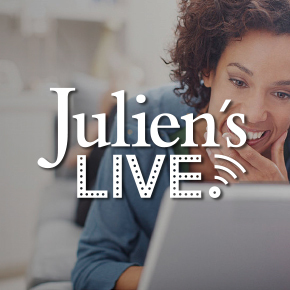 Julien regularly appears in media as an industry expert and has been featured on The Today Show, Entertainment Tonight, Access Hollywood, CNN, the BBC and many other high profile news outlets. A proud native of Indiana and self-described “world traveler”, Darren lives in Los Angeles, New York and London. Martin J. Nolan is the Executive Director, Chief Financial Officer and a principal of Julien’s Auctions. As CFO, he is responsible for assisting in formulating the company’s future direction and supporting tactical initiatives. He also manages the accounting, human resources, transaction processing systems, and legal and tax departments. As Executive Director, Nolan monitors and directs the implementation of strategic business plans and is a member of the Global Leadership team that manages Julien’s Auctions worldwide. Prior to joining Julien’s in 2005, Nolan’s extensive financial background included executive positions on Wall Street for over a decade with Merrill Lynch and J.P. Morgan Chase. A graduate of Reppert School of Auctioneering, Martin earned a Reppert Diploma, the sign of excellence in the field of auctioneering. Martin’s efforts are also concentrated on developing and expanding the company’s presence in Europe, Australia and Asia where Julien’s has maintained continued success with Nolan’s impressive global relationships. He has led Julien’s to build an ever-expanding international client base managing the company’s proprietary relationships with international exhibition partners such as the Museum of Style Icons in Ireland, The Museo de la Moda in Chile and The Mall Galleries in London which presented the 2016 record-breaking auction Pelé: THE COLLECTION featuring property of the three-time World Cup Champion, FIFA Player of the Century and Brazilian Football icon. Nolan’s passion for popular culture and the auction industry is only matched by his dedication to philanthropic efforts alongside Julien’s Auctions. A firm believer in the power of celebrity, Martin routinely assists charities in raising much needed funds and has conducted auctions for numerous high profile organizations including MusiCares, the Recording Academy charity that provides a safety net of critical assistance for music people in need. As a principal of Julien’s, Martin has been responsible for the planning and execution of high profile artifact auctions and collections. The innovative marketing campaigns and environments created by Julien’s Auctions has led the auction house to the dominant position it maintains in the industry. Collaborating with the famous and exclusive, Julien’s produces high profile auctions around the world, customized for particular markets and collectors. With high profile events in the sports, film, music and art markets, Julien’s has received international recognition for its auction events that attract thousands of collectors, investors, fans and enthusiasts from around the world. Martin has managed the sales of iconic artifacts and notable collections including the property of Marilyn Monroe, PELÉ, Mohammed Ali, John Lennon, Ringo Starr, Lady Gaga, CHER, Michael Jackson, U2, Jimi Hendrix, Barbra Streisand, Elvis Presley and Frank Sinatra, among many others. In 2016, Martin oversaw the three-day auction event of MARILYN, featuring property of famed acting coach Lee Strasberg, Lord David Gainsborough-Roberts and the infamous Jean Louis dress worn by the legend at Madison Square Garden in 1962. Julien’s Auctions was recently awarded its second placement in the Guinness Book of World Records for the sale of the world’s most expensive dress ever sold at auction, the Marilyn Monroe “Happy Birthday Mr. President” dress which sold for $4.81 million. Martin regularly appears on broadcast programs and international networks including the Today Show, CNN, CNBC the BBC and Reuters representing Julien’s Auctions in the global media. Born and raised in Athlone, Co. Roscommon, Ireland, he resides in Los Angeles and New York. Margaret Barrett, a California native who graduated from UCLA with a Bachelor of Arts degree in Art History and History, has been working in the auction business for a number of years. She’s held the positions of Cataloger/Specialist in the Entertainment Memorabilia Department at Butterfield & Butterfield in Los Angeles; Assistant Vice-President and Head of the Popular Arts Department at Christie’s in New York; Head of the Entertainment Memorabilia Department at Bonhams in Los Angeles; and Head of the Entertainment & Music Memorabilia Department at Heritage Auctions in Beverly Hills. Margaret has directed, managed, and sold numerous celebrity estates and is thrilled to now be part of the team at Julien’s Auctions. She continues to study the history of film by participating in and/or attending film fests, screenings, lectures, seminars, classes, tours, board meetings, and exhibits throughout the year and she is a longtime member of Hollywood Heritage, Inc., The Los Angeles Conservancy, The Hollywood Chamber of Commerce, and The Los Angeles County Museum of Art. Additionally, she was awarded a ‘key to the city’ from the mayor of Jonesboro, Georgia [hometown of “Gone with the Wind” author, Margaret Mitchell] for her work implementing a historic “Gone with the Wind” exhibition there. Gaby Douek was born and raised in Lima, Peru. She worked at the American Embassy in Lima before moving to New York. In New York, she worked at the United Nations as a Personal Assistant, first in the Office for Research and Collection of Information for the Secretary-General and then in the Office for the Coordination of Humanitarian Affairs. Gaby is bilingual. She enjoys photography and travelling, and has visited many countries in Europe. Gaby moved to Los Angeles in 2011 and joined Julien’s Auctions in June 2012 to work as an Executive Assistant. Michael Edwards was born and raised in Los Angeles, California. Joining the Julien’s team in 2016, he brings a deep knowledge of warehouse operations and unparalleled experience in the prep and handling of fine art and collectibles. Prior to joining the Julien’s team, Michael managed the Designer Services Shipping Department for a major Los Angeles moving company. Michael loves the outdoors and his cats Dr. Figaro Chookles, Phillip and The Moondancer. Summer has been passionate about photography since she was young. She shot her first roll of film, which was entirely of her dog, when she was eight years old. She attended Brooks Institute of Photography in Santa Barbara where she attained a B.A. in Professional Photography. While working for Bonhams & Butterfields, she continued her interest and development as an exhibiting fine art photographer. In 2011 she joined the Julien's team where she brings her enthusiasm, experience, and love of creative photography to the company. Brett Hughes is a connector of people, ideas, brands, and values. Having worked to create campaigns, verticals, and events for brands like Nike, ESPN, Under Armour, and various startups from the US to Europe, Brett has excelled at building communities, successful product launches, and high performing teams. After graduating from the University of Virginia as an All American and NCAA Champion, Brett played at the highest level of sports as a professional lacrosse player for nearly 10 years. Armed with the valuable lessons learned in a professional sports career and the discipline needed to compete, he has gone on to build business and relationships all over the world. Mr. Hughes built the lacrosse vertical for Los Angeles-based Student Sports before selling to ESPN, creating tailored content and one of a kind training and competition events in partnership with Nike for football, lacrosse, and baseball. Brett curated events and managed the west coast for the sports and entertainment company Thuzio. Hosting icons of sports and entertainment to share their stories through one of a kind evenings, Mr. Hughes built extensive executive level membership communities in Los Angeles and San Francisco. Brett is at Julien’s to bring the benefits and experiences from these former endeavors to build networks and inspire new growth in Julien’s incredible brand. Mr. Hughes is also the Co-Founder and Board Executive for International 501(c)3 Lacrosse the Nations, which uses the power of sport to help communities in need through education, coaching, and opportunity creation to change lives. Raised in a family of antique collectors, Mitchell Kaba early on developed a passion for historical objects. When his friends were spending their money on candy and video games, Mitchell was investing in first issue comics. His fascination for history and culture later inspired him to live in such diverse locales as New York, Seattle, Los Angeles, Alaska, Bangkok and Istanbul. Along the way he honed his skills as a researcher through work on various projects, including curating rare books to recreate the Antarctic library of explorer R.F. Scott for The Museum of Natural History. Mitchell is a graduate of the appraisal studies program at NYU and has successfully completed the USPAP course and exam, highlighting the Congressionally recognized set of appraisal standards promulgated by the Appraisal Foundation. His specialties include fine and decorative art, prints, books, photographs, acetate films and audio recordings. Ricardo (Ricky) Limon was born and raised in California. Ricky comes to Julien's with an extensive background in warehouse management, most recently the Estate of Michael Jackson. In 2010, Ricky joined the Julien's team. Jennifer Lorenzi is from Miami, FL and has earned degrees at Florida State University while studying in London, England (B.A., Art History) and Istituto Marangoni, in Milan, Italy (Intensive Diploma Fashion Design). Jennifer previously worked at Kerry Taylor and Augusta auction houses as well as with top New York designers, stylists, art galleries and museums. She currently specializes with the costume and fashion collections at Julien’s Auctions. Nima holds a Bachelor of Science degree from the Technical University of Berlin [Technische Universität Berlin] and a Master of Science degree from Steven's Institute of Technology in New Jersey. Since 2001, he has been working in information technology in multiple capacities such as network administrator, software developer, project manager, and founder. In 2007 he co-founded the auction software platform SAM and sold it to Bidpath in 2015 where it is used by numerous auction houses. He has been the Data Manager at Julien's Auctions since 2017, where he is integral to the electronic set-up of every auction conducted throughout the year. Darcie Mena was born and raised in Los Angeles, California. She joined the Julien's staff in April 2011. Having previously worked for a bank and two accounting firms, she gained comprehensive skills in client services and acquired strong accounting knowledge which she continues to apply to her roles of accounting at Julien's. Adrian Montes was born and raised in the San Gabriel Valley and returns to Southern California after an eight year stint in New England where he managed the warehouse of Forced Exposure Music Distribution. Adrian has also served time at various record shops in the Los Angeles area. He brings an enthusiasm for music, film, sport, fashion, art and pop culture happenings and mementos. As the property cataloger and receiver, Adriana works closely with the Director of Cataloging to ensure receipt of consignments, process and provide data entry on all items. She demonstrates great attention to detail and is highly organized which made her the perfect candidate for this position. She joined Julien’s staff in September 2015 and is a graduate from Mount St. Mary’s University, where she received a Bachelor of Arts degree in Sociology with a specialization in Criminology. Hillary inherited her interest in the film industry from her father, who worked for MGM for over 40 years beginning in 1929. Hillary has worked with many well known film directors, producers and writers, including Barbra Streisand (on “Yentl”), Tony Bill (“Six Weeks”), Jeff Kanew (“Tough Guys”) and Jon Peters (“Caddyshack”). She also partnered in a very successful Academy Award winning independent production company for over 20 years, producing the films as well as running the office and handling business affairs. It was during this period that she received an Academy Award nomination and became a member of the Academy, where she serves on several Executive Committees. She is delighted to be a member of Julien's Auctions staff as the Office Administrator which enables her to assist in the many facets of setting up the auctions. Carlos Romario Silva was born and raised in New Jersey, and his nationality is Peruvian. Carlos has been an athlete his whole life, playing the game of soccer since the age of 6 for many club and school teams. Carlos loves to travel and has been all over the U.S. as well as a few different countries and has volunteered in Bali, Indonesia for IVHQ. He is very passionate about sports and music and has extensive knowledge on both. He has had many jobs in all areas of work and is currently going to school for music production at Garnish Music Academy in Los Angeles. Carlos joined the Julien’s family in September 2018. Jason was born and raised in Thousand Oaks, California, just north of Los Angeles. He studied music from a young age and later attended Pepperdine University for Classical Piano performance. Since then he has gained extensive experience as a touring and studio musician, resulting in a vast firsthand knowledge of music history and equipment. Additionally, having almost a decade of experience working in the auction world, he has dealt with a wide array of rare and valuable antiques, artworks, automobiles, musical instruments, and other items. Jason joined the Julien’s team in 2014 and currently works as a cataloger. Isabel Yeo was born and raised in Singapore, where her family continues to reside today. Isabel loves to travel and has visited numerous countries in Europe, Asia, as well as various cities in the U.S, Europe, Canada, Australia, and New Zealand. She attended Choate Rosemary Hall, a boarding school in Connecticut at the age of sixteen, and moved to Los Angeles in 2006. Isabel began her studies in Art History, French, and Business Administration as a freshman at the University of Southern California. While in college, Isabel interned and worked part-time at various art galleries in Los Angeles, as well as Christie's and Bonham's. Her interest in gemology and the jewelry market has led her to pursue a Gemological Graduate degree at the Gemological Institute of America. Isabel joined the Julien's family in January 2011.